A cell wall is an outer layer surrounding certain cells that is outside of the cell membrane. All cells have cell membranes, but generally only plants, fungi, algae, most bacteria, and archaea have cells with cell walls. The cell wall provides strength and structural support to the cell, and can control to some extent what types and concentrations of molecules enter and leave the cell. The materials that make up the cell wall differ depending on the type of organism. The cell wall has evolved many different times among different groups of organisms. The cell wall has a few different functions. It is flexible, but provides strength to the cell, which helps protect the cell against physical damage. It also gives the cell its shape and allows the organism to maintain a certain shape overall. The cell wall can also provide protection from pathogens such as bacteria that are trying to invade the cell. The structure of the cell wall allows many small molecules to pass through it, but not larger molecules that could harm the cell. The main component of the plant cell wall is cellulose, a carbohydrate that forms long fibers and gives the cell wall its rigidity. Cellulose fibers group together to form bundles called microfibrils. Other important carbohydrates include hemicellulose, pectin, and liginin. These carbohydrates form a network along with structural proteins to form the cell wall. Plant cells that are in the process of growing have primary cell walls, which are thin. Once the cells are fully grown, they develop secondary cell walls. The secondary cell wall is a thick layer that is formed on the inside of the primary cell wall. This layer is what is usually meant when referring to a plant’s cell wall. There is also another layer in between plant cells called the middle lamella; it is pectin-rich and helps plant cells stick together. The cell walls of plant cells help them maintain turgor pressure, which is the pressure of the cell membrane pressing against the cell wall. Ideally, plants cells should have lots of water within them, leading to high turgidity. Whereas a cell without a cell wall, such as an animal cell, can swell and burst of too much water diffuses into it, plants need to be in hypotonic solutions (more water inside than outside, leading to lots of water entering the cell) to maintain turgor pressure and their structural shape. The cell wall efficiently holds water in so that the cell does not burst. When turgor pressure is lost, a plant will begin to wilt. Turgor pressure is what gives plant cells their characteristic square shape; the cells are full of water, so they fill up the space available and press against each other. 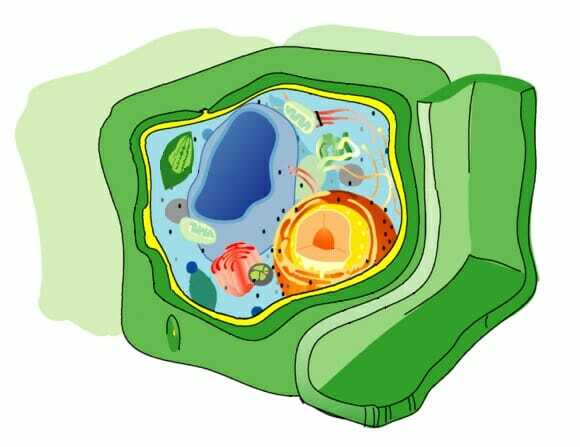 This diagram of a plant cell depicts the cell wall in green, surrounding the contents of the cell. Algae are a diverse group, and the diversity in their cell walls reflects this. Some algae, such as green algae, have cell walls that are similar in structure to those of plants. Other algae, such as brown algae and red algae, have cellulose along with other polysaccharides or fibrils. Diatoms have cell walls that are made from silicic acid. Other important molecules in algal cell walls include mannans, xylans, and alginic acid. The cell walls of fungi contain chitin, which is a glucose derivative that is similar in structure to cellulose. Layers of chitin are very tough; chitin is the same molecule found in the rigid exoskeletons of animals such as insects and crustaceans. Glucans, which are other glucose polymers, are also found in the fungal cell wall along with lipids and proteins. Fungi have proteins called hydrophobins in their cell walls. Found only in fungi, hydrophobins give the cells strength, help them adhere to surfaces, and help control the movement of water into the cells. In fungi, the cell wall is the most external layer, and surrounds the cell membrane. The cell walls of bacteria usually contain the polysaccharide peptidoglycan, which is porous and lets small molecules through. Together, the cell membrane and cell wall are referred to as the cell envelope. The cell wall is an essential part of survival for many bacteria. It provides mechanical structure to bacteria, which are single-celled, and it also protects them from internal turgor pressure. Bacteria have higher concentration of molecules such as proteins within themselves as compared to their environment, so the cell wall stops water from rushing into the cell. Differences in cell wall thickness also make Gram staining possible. Gram staining is used for the general identification of bacteria; bacteria with thick cell walls are gram-positive, while bacteria with thinner cell walls are gram-negative. While archaea are similar in many ways to bacteria, hardly any archaeal walls contain peptidoglycan. There are several different types of cell walls in archaea. Some are composed of pseudopeptidoglycan, some have polysaccharides, some have glycoproteins, and others have surface-layer proteins (called an S-layer, which can also be found in bacteria). Cell membrane – A membrane found on the outside of all cells that separates them from the outside environment. Turgor pressure – Water pressure inside cells. Chitin – A polysaccharide that is a main component of fungal cell walls and also of the exoskeletons of certain animals like insects. 1. Which is a function of the cell wall? D is correct. All of these are functions of the cell wall. 2. The cells of which group of organisms lack a cell wall? C is correct. Animal cells do not have cell walls; they only have a cell membrane that is semipermeable. Animal cells are able to move more easily without a cell wall. 3. Which organism has a cell wall containing chitin? C is correct. The cell walls of fungi contain chitin, which makes them strong and tough. Chitin is a polysaccharide that also forms the exoskeletons of some insects and crustaceans.